In recent years, the productivity demands on the food and beverage industry have risen significantly. Growing product diversity and constantly changing packaging makes handling using conventional block warehouses inefficient. This increases the demand for more efficient storage and picking solutions. To meet this challenge, SSI Schaefer has designed a full and complete range of innovative applications to satisfy this industry’s needs. Both standard and bespoke solutions cover all likely requirements and more, extending from simple static storage systems to complex, automated e-commerce operations, including systems designed to operate in frozen and chilled environments. Back in 2009, SSI Schaefer implemented a three-aisle automated high bay warehouse (HBW) for Budweiser (Czech Republic) with a direct link to production. At the time, the system layout was designed as a growing, future-proof solution that would accommodate the upcoming expansion. The new project will see SSI Schaefer create a seven-aisle high bay warehouse with more than 19,000 pallet storage locations. Pallet cranes from SSI Schaefer’s latest Exyz generation will ensure quick, energy-efficient processes with more than 160 pallet stock additions and 280 pallet retrievals per hour. The production building and the new distribution center will be linked via a bridge over the street with an electric monorail system (EMS). In the new distribution centre, an additional EMS with 21 vehicles will transport pallets between the HBW pre-zone and the dispatch area. 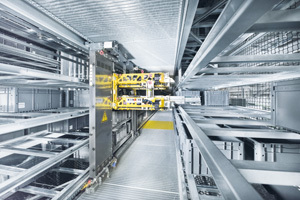 The systems in the existing buildings will also be connected via a conveying system. In addition to roughly 730 conveying system components, SSI Schaefer is also installing a pallet checking station and empties checking function, a pallet changer, and a new material flow system. The in-house developed WAMAS® logistics software with WAMAS® Lighthouse provide visualisation of the system, while configurable dashboards will make it possible to optimize material flows at any time. 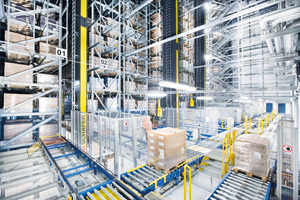 One of the country’s largest food retailers, chose SSI SCHAEFER as general contractor for intralogistics to provide them with a cutting-edge system covering an operational area of almost 5,000m² in their home delivery-only, online fulfilment store. The core of the system is an 18-aisle shipping and consolidation buffer with 19,200 storage locations for temporary storage of picked orders of dry, fresh and frozen food. The buffer enables the separation of picking and goods-out processes, allowing easy consolidation and sequencing before loading the delivery vehicles. In the shipping buffer, 36 Navette multi-level shuttles and a total of 40 lifts process almost 700 orders with 3,600 bins per hour in a 3-shift operation. The times for retrieval and provision are timed backwards and scheduled so that refrigerated and frozen goods are provided on the buffer conveyors at goods-out in the correct loading order, thereby fulfilling the requirements for a continuous cold chain. This is calculated using the warehouse control system of the logistics software WAMAS® by SSI Schaefer. 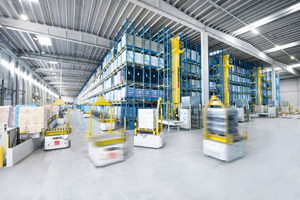 The system was installed with a module for controlling flow of goods and system components, and is connected directly to the customer’s warehouse management system. A.J and C.I Snell, one of the UK’s leading fresh and frozen fruit growers, has constructed a new cold store fully equipped with a mobile pallet racking system supplied and installed by SSI Schaefer. Established in 1989, the Snell organisation at Harewood End, near Hereford, produces an impressive 1,300 tonnes of Strawberries, Raspberries, Blackberries and Blueberries, each year and a further 700 tonnes of Blackcurrants for juice processing, IQF, and Soil Association Organic. The company operates a state-of-the-art 2000-tonne capacity packhouse and, along with the new pallet freezer store offers blast freezing facilities and puree production as well as contract storage and packing for local growers. SSI Schaefer was actively involved in sizing and designing the new cold store – from the inside out. The mobile pallet racking system holds up to 900 standard (‘Chep’) pallets enabling Snell to maximise their storage capacity for frozen fruit while at the same time minimising the refrigeration overhead. A.J and C.I Snell’s core business is the supply of fresh fruit to supermarkets but the extensive cold store enables the business to build stock for supply outside of the traditional growing season. Snell’s customer base includes a number of well-known high street names such as M&S, Sainsbury’s and Tesco and, being the largest organic blackcurrant grower in the UK, the company also supplies produce to food processing operations including Yeo Valley and SmithKline Beecham. Better cold store design and, more specifically, better storage technology can result in considerably lower labour costs and lower energy bills as a result of maintaining low temperatures – by chilling less ‘fresh air’ and preventing external warm air from entering the system. 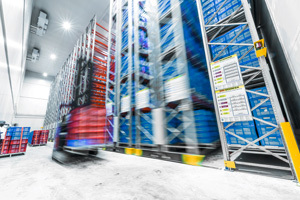 By using pallet conveyor with inbound and outbound spurs, pallets can be placed onto a conveyor outside the freezer, entering via high-speed compartment doors – the doors are then sealed quickly to minimise warmer exterior air entering the cold store. Once the pallets enter the freezer warehouse they travel on conveyor to the pick-up point. Lift trucks then pick the pallets from the end of the conveyor line for put-away, resulting in reduced travel time due to much shorter distances between pick-up and storage locations. This also results in considerably lower labour costs because the same throughput can be accomplished with fewer operators, while lift truck wear-and-tear is significantly reduced by shorter travel distances. Outbound picking – in which pallets are placed on an outbound conveyor – also results in much shorter travel distances, less lift truck use, less wasted time and lower resultant costs. In this instance the trucks remain inside the cold store throughout, eliminating further potential for warm air to enter the cold store via continual truck movement through large doors equipped with plastic strip curtains, which are commonly used in the industry. The other component of a better cold store design is better storage technology, more specifically a high-density storage system. A typical cold store utilises selective pallet racking technology with aisles widths of up to four metres. With any freezer warehouse storage system having aisles for lift-trucks to manoeuvre in, it becomes quickly evident that a significant proportion of what is being frozen is simply air. A mobile racking system provides an effective means of dense storage and can be used to negate this waste of energy used in the freezing process. 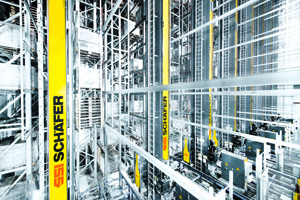 SSI Schaefer’s Mobile Pallet Racking uniquely addresses building and warehouse heights under 15 metres. The system uses conventional selective pallet racks mounted on carriages and moving on running rail tracks and guide rails embedded directly into concrete floor. Since energy expenses in a freezer warehouse are second only to labour costs, it makes sense to double the amount of pallet locations inside the building or reduce the initial building size. Doubling the amount of pallet positions can reduce the total cost per pallet position by as much as 40% in new construction projects, and can reduce utility bills by as much as 50%. High-density storage solutions such as Mobile Racking result in a much smaller building footprint by up to 45%. A significant reduction in energy loss (and utility bills) also ensues, due to the correspondingly-smaller roof structure reducing air escape. The other cost savings of a smaller, more efficient Mobile Racking warehouse include a 35% lower overall investment in construction costs and a reduction of up to 49% in utility costs. Mobile pallet racking also has considerable capacity for carrying weight and can accommodate 48 tonnes per bay (double-sided) or 500 tonnes per base. Its aisle opening speed is 4 metres per minute, allowing 100% accessibility. It is a pragmatic, smart, state-of the-art solution for freezer warehousing. Automated Guided Vehicles are assuming even greater importance in the food and beverage industry. In increasing use at both production facilities and distribution warehouses, their flexibility gives them a distinct advantage over fixed route transport systems such as conveyors. 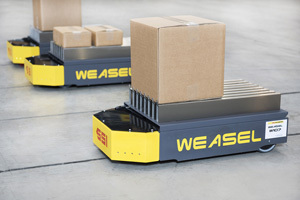 SSI Schaefer’s Weasel masters almost all transport tasks for loads up to 35kg and ensures an optimal, ‘barrier-free’ material flow, with low purchasing and operating costs, as well as a rapid return on investment. Heavy duty version AGVs are also available to carry larger loads (e.g. pallets) and heavy crates. The SSI Schaefer Group is the world’s leading provider of modular warehousing and logistics solutions. It employs over 9,500 people at its group headquarters in Neunkirchen (Germany) as well as at more than ten domestic and international production sites, and at approximately 70 worldwide operative subsidiaries. Across six continents, SSI Schaefer develops and implements innovative industry-specific answers to its customers’ unique challenges. As a result, it plays a key role in shaping the future of intralogistics. SSI Schaefer designs, develops and manufactures systems for warehouses, industrial plants, workshops and offices. Its portfolio includes manual and automated solutions for warehousing, conveying, picking and sorting, plus technologies for waste management and recycling. In addition, SSI Schaefer is now a leading provider of modular, regularly updated software for in-house material flows. Its IT team, with a headcount in excess of 1,100, develops high-performance applications, and provides customers with in-depth advice on the intelligent combination of software with intralogistics equipment. SSI Schaefer’s broad IT offering, including its own WAMAS® and SAP products, delivers seamless support for all warehouse and material flow management processes. Solutions from SSI Schaefer improve the productivity and efficiency of customer organizations – not least through the highly precise monitoring, visualisation and analysis of operational metrics for proactive intralogistics management.